A monk Lobsang Samten and James Guthrie beside a willow tree in the countryside near Lhasa. Guthrie, who was the Civil Surgeon Bhutan and Tibet from 1945 onwards, is wearing a suit. Other Information - Biography: See Alex McKay, Tibet and the British Raj, Richmond, Curzon Press, 1997, pp 167-8 . James Guthrie took up post as Medical Officer Gyantse in September 1934 - November 1935 and as Civil Surgeon Bhutan and Tibet from March 1945. " ... Major James Guthrie, though inclined to use his command of Tibetan to say what his superiors considred 'the most stupid and senseless things', had a great empathy with the Tibetans. Guthrie was given considerable reponsibility as the only senior British officer in Lhasa during Pemba Tsering's first months in charge of the mission [April 1945]. 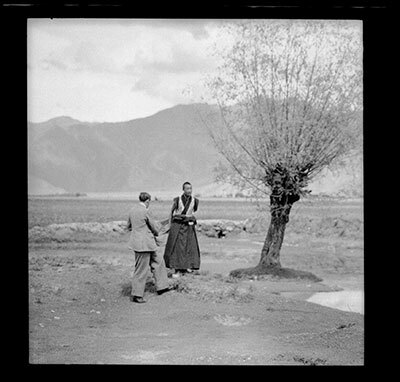 Among Guthrie's varied tasks in Lhasa was an operation to remove a cyst from the eye of one of the Dalai Lama's peacocks. The worried young Dalai Lama watched the operation and he remebers that Guthrie assured him, in the three forms of Tibetan speech, inferior, regular, and onorific, 'Don't worry, it will not die.'" The Tibet Album. "James Guthrie and Lobsang Samten beside a willow tree" 05 Dec. 2006. The Pitt Rivers Museum. <http://tibet.prm.ox.ac.uk/photo_2001.59.7.66.1.html>.